Scroll to the bottom of this page for our contact info or continue to read about the sport. 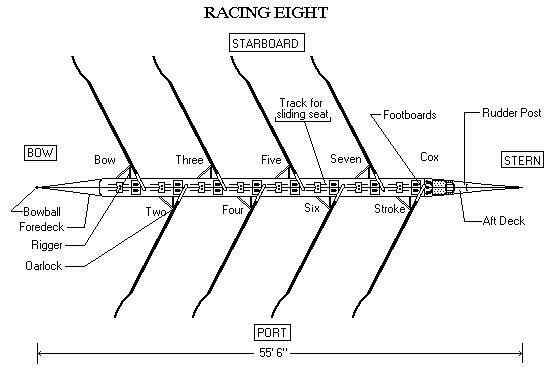 Rowers move the boat using oars and are ordered according to numbers starting from the bow seat up to the stern seat (see Boat Anatomy section or diagram for positions and terminology). The rower seated in the first seat is referred to as the 'bow seat' or 'bowman'. While the rower in the highest numbered seat closest to the stern is called the 'stroke'. 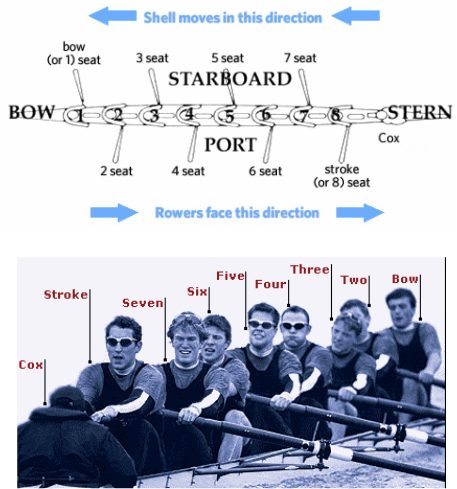 In an 8+ boat, the stern pair (the stroke seat and the seat behind it) are responsible for setting the rhythm and stroke rate for the rest of the rowers in the boat to follow. The middle four of the 8+ boat take on a less technical role as they follow the pace set by the stern pair. 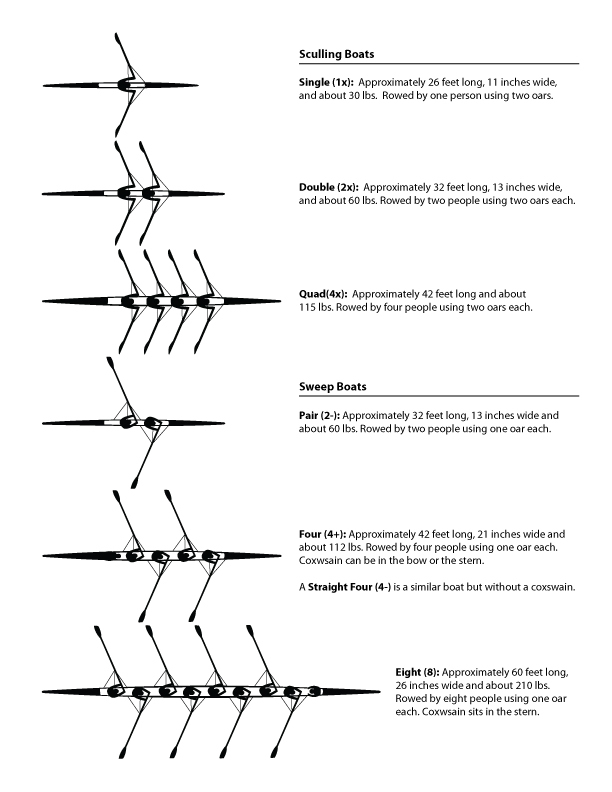 Middle four rowers tend to be the more powerful rowers of the boat and are commonly referred to as the 'engine room' or 'powerhouse' of the boat. The bow pair take on a more technical role, as they are responsible for setting the balance of the boat and setting the line in which the boat steers. The coxswain takes on a critical role in the boat as they are in charge of steering the boat, and telling the rowers at what rate, rhythm, and level of power they need to row at. Coxswains are commonly seated in front of the stern seat facing the rowers, although they can also be found sitting behind bow seat in bowlders facing away from the rowers (common in coxed four and coxed pair boats). Coxswains sit in their seats (or lay in bowloaders) and instruct rowers using a cox box and speakers. The minimum weight requirement for coxswains in the U.S. is 120 lbs. for men's boats and 110 lbs. for women's boats. The lighter the coxswain is, the less effort rowers have to put in to move the boat. If coxswains are below the minimum weight, they may be required to carry weights or sandbags with them in the boat. Double (2x): Seats two rowers, no coxswain, and employs the sculling style to row. Quad (4x): Seats four rowers, no coxswain, and employs sculling style. Pair (2): Seats two rowers, uses sweep style rowing (each rower uses one oar) and can seat a coxswain. Four (4+): Seats four rowers and a coxswain, and rowers utilize sweep style rowing. Eight (8+): Seats eight rowers and a coxswain, and rowers use sweep style rowing. Note: (x) means sculling style is used, (+) means the boat seats a coxswain in addition to rowers, and (-) means the boat does not seat a coxswain. Bowball: small rubber ball attached to the front of the boat, used for safety and determining finishing order of boats in a race. Cox box: voice amplifier used by coxswain, may also give readout of boat speed, stroke rate, and time. Foot stretcher/footboard: adjustable footboard to which shoes are attached and can be moved closer to the frontstop of tracks on which the seats slide. Oar: a pole used by rowers to propel the boat. Held in place by oarlocks and consists of a 'handle' end (held by rowers) and a 'blade' end (placed in the water when moving the boat). Rigger: projection from the side of the boat on which the oarlock is located at the end of. Mentioned parts are also found on all other types of boats (except for the cox box which is only found in boats seating coxswains). Visit U.S Rowing to learn even more about rowing!